Although we specialise in moving people to Greece and the Greek islands, our system works perfectly in reverse too! Whether you’re relocating back to the UK, or elsewhere in Europe (we’ve moved lots of people from Greece to France, from Greece to the Netherlands and so on), Nomad can help. We’ve even moved people from Greece to Australia, New Zealand and the USA. Financial Security: as a BAR member, Nomad is covered by the BAR’s Advance Payment Guarantee, which provides a guarantee that if your removal company goes bankrupt while in possession of your goods, your removal will be completed to the same standard by another BAR member company. Given there has already been at least one case of a “removal company” (not a BAR member) going bust on the island of Crete in 2018, with their customers experiencing exactly this problem, it is more important than ever to make sure you only use a BAR member company for your removal. Nomad is a very well-established company and very financially secure, so our customers needn’t worry. But with this external guarantee in place you have complete security. No Agents: for removals to and from Greece, we do the entire job ourselves from door-to-door. This might sound obvious, but most companies don’t actually cover Greece themselves, so they use agents. In Nomad’s case, it will be our actual team – the same people our customers are describing on our testimonials page – collecting your goods in Greece, handling your goods the whole way, and delivering them to your home in the UK. Specialisation: as genuine specialists in Greece, we know what we are doing. If you live on a remote island with only one ferry a week, we can help you. If you live in a village where there is only pedestrian access, we can help you. If you are moving a huge quantity of goods including a life-sized bronze tiger (which really happened), we can help you. If you need to arrange a crane or an external elevator in Greece, we can help you. We have been doing removals to and from Greece for more than 15 years, and we are experts at it. 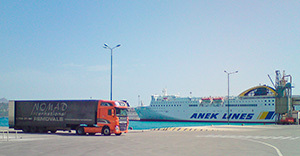 In addition, we are not just a transport company that specialises in Greece – we are a removal company that specialises in Greece, which means we know how to export pack and wrap your belongings professionally, using the right materials; we know how to load vehicles properly to avoid damage to furniture and fragile items; we are experienced in handling artwork and antiques; and our insurance, processes and systems are all designed for removals. The above points are only the top 5, but many customers also use us because we have shuttle vans that can access their property; or because we offer two weeks’ free storage on returning to the UK (which can help with timings if the new home isn’t ready yet); or because we can transport vehicles as well as furniture & personal effects. Many others use Nomad because we use overland transport, which is far more reliable and faster than sea container shipping; or because we handle all of the paperwork for you; or because we provide proper insurance to cover you (not us) against risk during your move. Nomad is the only British BAR member company that truly specialises in removals to and from Greece, so it is no wonder we are the number one choice for removals Greece to UK. In addition to helping people who are moving home from Greece, Nomad is perfectly suited to helping Greek furniture manufacturers and other exporters to deliver their goods to the UK (or across Europe). We have the skills and the equipment specifically suited to the transport of furniture and fragile items, so we are the ideal company to use if you are exporting these goods from Greece to the UK and Europe. If you would like a quote please don’t hesitate to contact us. We would be happy to help.